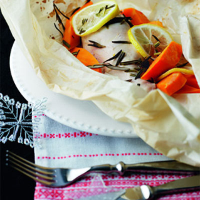 Enjoy the wonderful flavour of lemon chicken parcels baked with sweet potatoes, rosemary and garlic, in this low fat supper. Preheat the oven to 200°C, gas mark 6. Cut 4 pieces of baking parchment about 4 times the size of each chicken breast, and fold each piece in half. Place a chicken breast in the middle of each sheet. Divide the sweet potato and the lemon juice equally between each parcel. Add 2 garlic cloves and sprinkle with the rosemary. Season with freshly ground black pepper. Place 2 slices of lemon on top of each chicken breast then fold the parchment over to make a parcel, tucking the edges under to ensure no steam will escape. Place on a baking sheet. Cook the parcels in the oven for 30 minutes, or until the potatoes are tender and the chicken is cooked through. Serve with baby leaf greens or curly kale. Try cooking the chicken with a different combination of ingredients such as sliced mushrooms, white wine and thyme.